Jagan, 08 Mar 2012How is the Gaming experience in N9. What are games pre-installed and what games that OVI prov... morei played all three pre loaded games till my shortsightedness increased.... what u think? The N9 now has full (10.1) Flash support. Pre-installed: Angrybirds, GOF2, NFS Shift, real golf 2011.
dear n9er's do any one know when this pr 1.2 will be vailable i uae? Itis anice but how can i use the front camera ,and how can l delete names in sim card . How is the Gaming experience in N9. What are games pre-installed and what games that OVI provides..? how to disable the light ambient sensor ????? AnonD-26593, 07 Mar 2012http://blog.gsmarena.com/firefox-for-nokia-n9-gets-flash-support/It works, nice adition for N9, but i would like to have it in the default browser instead of only in firefox. It doesnt really "stutter" but sometimes flash content stops playing (audio does not stop). From what i tested so far i have to call this a alpha release, has a long way to go. Still need to use N9's youtube player for a good viewing experience. CS10, 05 Mar 2012HELP PLEASE!!!! 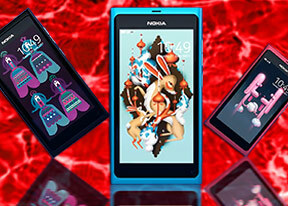 If you have to choose between NOKIA N9 and HTC Sensation?? I'm constantly ... moreN9!! D_G, 07 Mar 2012you can now download Flash from Nokia store and it will play on the firefox browser only but s... morethe synching between the N9 firefox browser and the desktop browser is smooth. you can now download Flash from Nokia store and it will play on the firefox browser only but still. i use firefox as default on my desktop PC and the OTA between desktop bookmarks and N9 firefox browser is faultless. now you can watch flash videos and you can have video chat through gtalk on it (works very well with wifi and 3.5 G network). the only missing part for me at the moment is the whatsapp app which is being worked on from what i have been reading.